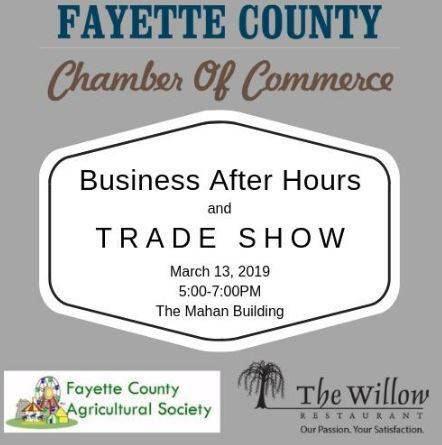 The Fayette County Chamber of Commerce, hosted in conjunction with sponsors The Willow Restaurant and Catering and The Fayette County Agricultural Society, will hold a “Mini-Trade Show” this spring. The Business After Hours and Trade Show will be held on March 13 from 5 to 7 p.m. at the Mahan Building on the Fayette County Fairgrounds. The Chamber invites its members to participate in this opportunity to share their businesses with other chamber members of the community. During the event, members of the Chamber can set up a display with information on their products and/or services, and the Chamber will even provide the table, a recent press release said. Bolender also reminded the community about the upcoming Groundhog Breakfast — sponsored by McDonald’s of Fayette County — scheduled for Friday, Feb. 1 at 7 a.m. at the Mahan Building on the county fairgrounds. This event is open to the public and anyone interested in developing their workforce, business or even their personal growth is encouraged to attend. This is a reservation only event, and those interested can reserve their seat by calling the chamber office at 335-0761 or online at www.fayettecountyohio.com. The information in this article was provided by Julie Bolender, President of the Fayette County Chamber of Commerce. For more information visit the Chamber office at 206 E. Court Street in Washington Court House or call (740) 335-0761.